COLOGNE, Germany, Sept. 20, 2016 (GLOBE NEWSWIRE) — Lexar, a leading global brand of flash memory products, today announced the new 256GB capacity Lexar® High-Performance 633x microSDXC™ UHS-I (U3) memory card. Designed for sports camcorders, tablets, and smartphones, the 633x microSDXC UHS-I card has read transfer speeds up to 95MB* per second and can capture more than 36 hours of HD video; 67,600 photos; or 58,100 songs. ** The 256GB capacity card is currently on display at Photokina 2016. The new 256GB capacity card is capable of recording up to 36 hours of HD video adventures, perfect for aerial camera enthusiasts who too often have to carry multiple memory cards for extended use. It also offers UHS Speed Class 3 (U3) video recording speeds, ideal for capturing extended lengths of 4K video. The microSDXC card comes with a USB 3.0 reader, which allows for quick and easy file transfer from the card to a PC or Mac® computer. The card includes a limited lifetime warranty*** and a one-year limited warranty for the USB 3.0 reader. All Lexar product designs undergo extensive testing in the Lexar Quality Labs, facilities with more than 1,100 digital devices, to ensure performance, quality, compatibility, and reliability. The new card will be coming soon, with an MSRP of $274.99. 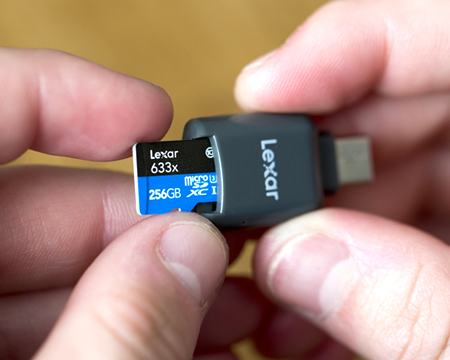 For more information about Lexar products, visit www.lexar.com. Lexar will showcase its latest high-performance memory solutions, including the new 256GB capacity card, at Photokina 2016, Hall 2.1, Booth B030.